After the project "Talk to the can" to Monkey Wrench Design, artist Bryan Cera offers another way to call in an original and above all practical. 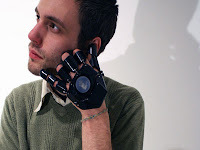 Man has devised a 3D printed glove acting as a mobile phone. The concept is called One Glove. Made with a 3D printer, it looks like a manual articulated exoskeleton. The speaker is built into the thumb and little finger in the microwave. The buttons to dial phone numbers are at the other three fingers.